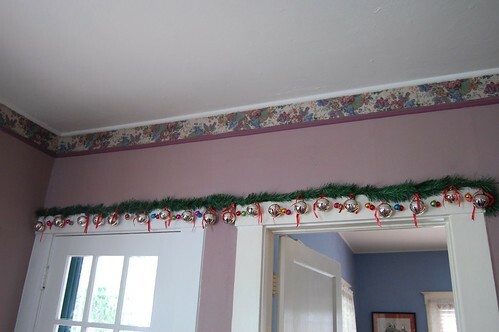 We didn't do a Star Trek garland this year, after all the drama Tom endured putting it up last year. 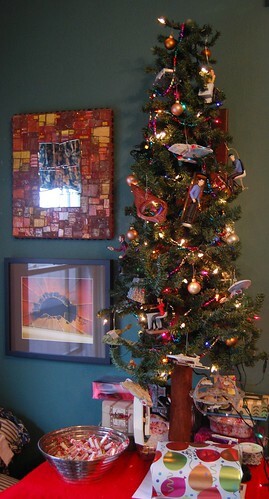 Instead, we used the small tree for the Star Trek ships and character ornaments. 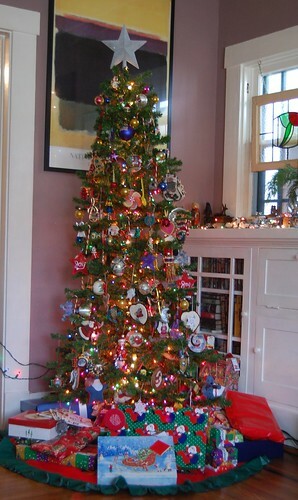 I first called it the Geek Tree, but I finally settled on the Birthday Tree, since Tom's a Christmas baby. I put his birthday presents and cards under it as they came in. 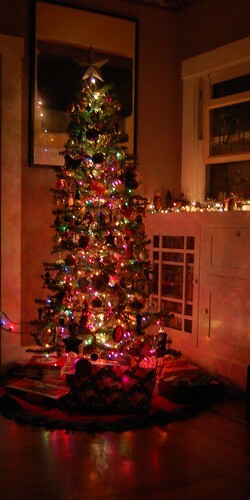 Every time I plug in the light cord, most of the ornaments talk to me. I'm so tired of hearing Janeway, but I never get tired of the Borg and Spock. Likewise, the sleigh bells have grown too numerous for their old display tree. This year, we hung them over a couple of the doors in the living room. 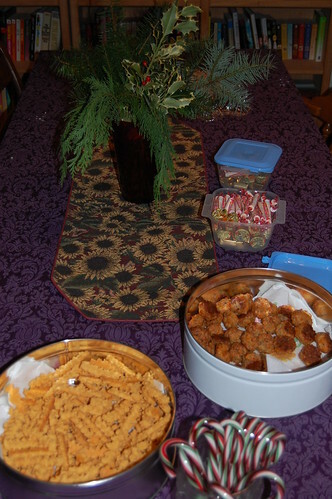 And cheese straws along with sausage-and-cheese balls, all holiday traditions in my house and Lynne's. Of course, the Barbie ornaments got their garland. 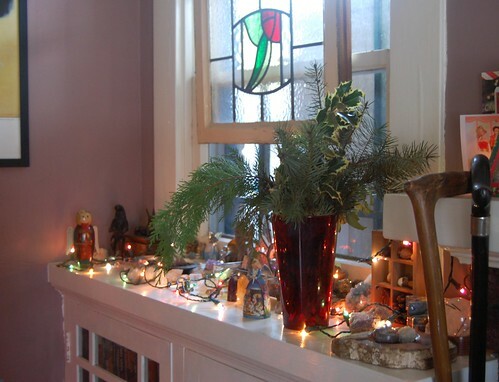 where many of my rocks, stones, and crystals enjoy colorful lights, too. 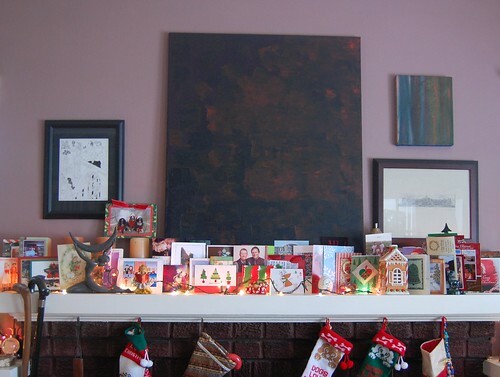 Here are a few of the cards we received this year--I took this before the last flurry of them arrived. 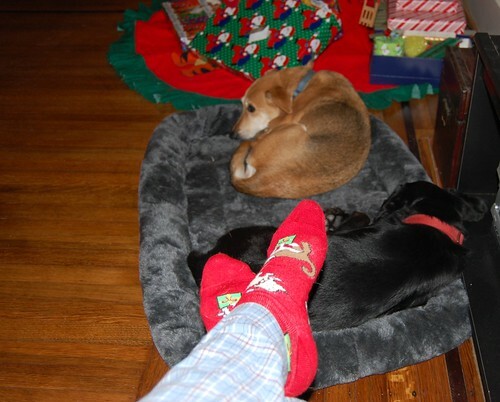 The night we decorated, in honor of 'Nathan's tradition, I wore Christmas socks. Here's proof, along with Guinness and Margot snoozing in their new dog bed (it's usually next to my desk in the office). 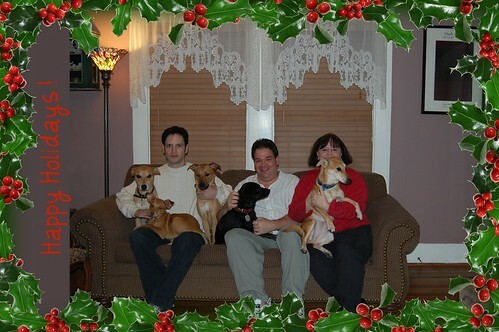 This is the family photo we sent out with our Christmas cards. I could barely hold Margot, who wanted to get back to Ft. Emo to write poetry about forced holiday celebrations. Because she's moving toward the camera, she looks like the largest of the dogs. Note that Tim's Rex and Pixie are joined by their houseguest, Puddles. And Guinness is just hoping Tom will give her a treat when this ordeal is over. 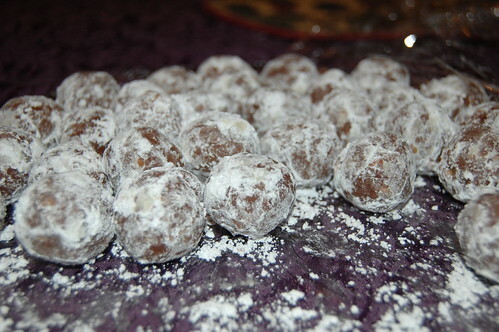 Thanks for indulging me. Still to come: photos of the people and hounds at The Compound throughout the holiday season, including the brave little rescue known as Pirate Paco. Then I'll really be finished and ready for a new year of photos!